My “new” yellow painted upright piano is finished! And this time, it’s just right. 🙂 I realize not everyone will agree that this is an improvement, but for me, and for my house, and for the vision I have for this room, it couldn’t be more perfect! This is exactly what I envisioned all along, although I didn’t envision it sitting against a black wall. That was one of my many (failed) attempts to make that other piano work in this room, so the black wall is temporary. This wall will soon be filled with tree limbs and colorful happy birds. So if you’re thinking, “Kristi, I thought this piano was already finished!” then that means you missed this post. The color I chose for my new and improved piano is appropriately called Smiley Face by Behr. 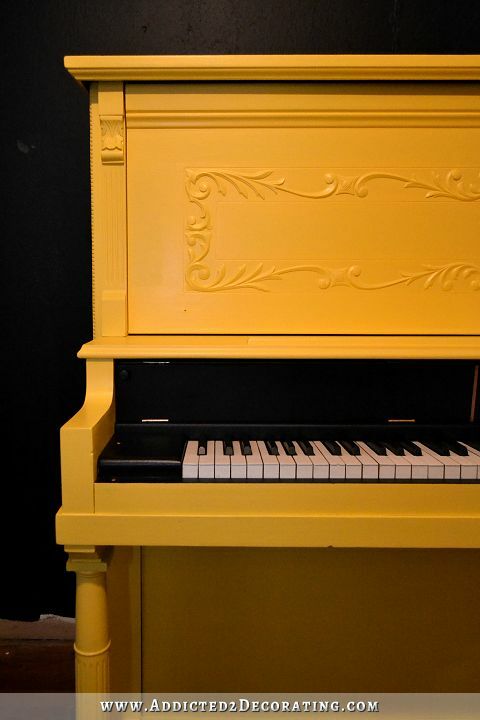 And this yellow piano truly puts a smile on my face. I’m so happy that I had a change of heart, and decided to do what I actually wanted to do rather than what I felt obligated to do. Now I’m really excited to tackle this room and get the walls finished. 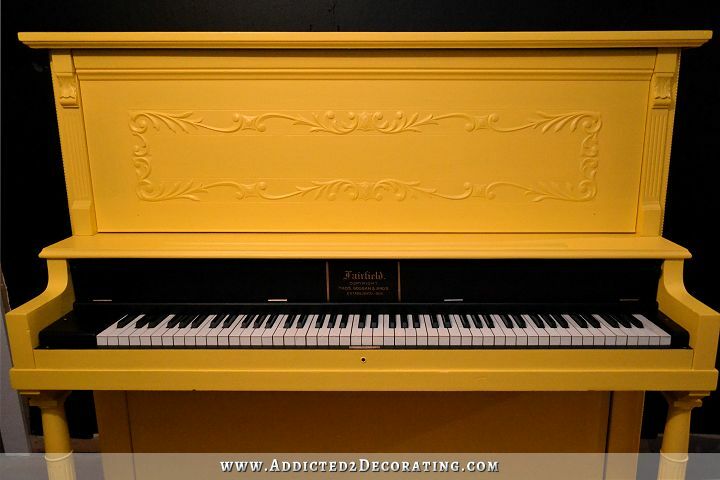 While that other piano couldn’t hold its own against the Schmacher wallpaper (or my DIY version of it), this bright, happy, yellow piano certainly can. And it’ll be perfect! I love the yellow. its so much more me too! I love the color and I think it will look great with the wallpaper. Sometimes we put pleasing others in front of what we would like best and that’s not always the way to go… Good for you for doing what you wanted! I think it looks great! Your smiley face piano is able to make me smile although I am too far from you. Regards from Turkey. Looks fantastic and so much more you! Can’t wait to see it after you finish the room! THIS looks amazing!! I liked the way you painted it before, but that coupled with the wallpaper just didn’t seem to go with the style of the rest of your house. This is just what it needed! I liked the grey but this is great too!! Such a happy piano!! I love it! I’m doing a happy dance for you!!! In honour of Ardith’s “Snoopy dance”, I think based on colour and level of happy this piano owns, it shall henceforth be named “Woodstock”. 🙂 LOVE IT! A very happy piano! Enjoy your hard work. It is sunny and happy like you. Yes! Now it will look so much better against that design on the wall! Can hardly wait to hear you play! I have a lot of practicing to do before I’ll video myself playing. I finally sat down to play it this past weekend, and to call my skills rusty would be a huge understatement. 😀 It’s slowly coming back to me, but I haven’t played in about nine years. Oh yeah, that’s better. Don’t take this as an insult, because it isn’t… The grey piano, while beautifully done, was a piano for an adult room. And by tha, I mean a safe, staid, conservative room. It would have turned out well because if a client wanted safe, staid and conservative, you could pull it off. But I’ve come to expect more color, more adventure, more fun in your own environment. The yellow piano should be a reminder to pay attention to your own decorating weather vane! You know what will make your heart sing. Go with it! I wouldn’t have done a combination grey and stain piano myself – but I appreciated the fact that it was well done and looked very good. That said – it wasn’t at all in keeping with your usual style and if I recall correctly I posted that you may have put yourself in a position of trying to decorate around it rather than it complimenting your chosen direction. The yellow looks fantastic and, I have to say, so does the black wall behind it. I may be a little biased there since I recently painted one wall of my bedroom in black and have become obsessed with the way any and all colours pop against it. Kristi, so glad you’re happy with how the piano turned out. I was just curious if you considered doing anything to “highlight” the carved detail on upper part and, if so, what that might be? I was thinking the same thing but don’t know what it could be. Seems like it should have a shine to it…like maybe just some polyurethane. Same thought about highlighting the detail somehow and breaking up the yellow expanse just a bit….I was thinking black swoopy curvy lines along the edges of the raised parts that would tie in with the swoopy curvy lines I think you are going to do with your tree branches. Perhaps a birdie that swooped down from the wall as well?????? You have inspired me…gonna paint my piano RED!!!!! Wheee!!!!! Oh Corrine, what a fun idea! I had to scroll back up just to look at it and imagine that a baby bird had strayed down to the curving branch on the piano front! An absolute grace note! Oh yes ! that would be perfect a small bird from the “paper” wall yes, yes, yes!!! I am glad you went with yellow. The grey was ok, the yellow, smashing. I can’t wait to see the wall! YES!!!! I love it and I cannot wait to see it front of those happy birds! Yes! Smiley face yellow brings a big smile to my face! Looking forward to seeing this room develop FOR YOU! Love it!! That last photo with the hint of your kitchen in the background the yellow and green look great together!! I am so happy you did “your thang” it will all work out!! Ill be watching!! Love it!!!!! Can’t wait to see the wall!!!!! Love it. It does make me smile! You dont need to defend your choices against people on the internet! We dont live in your house- you do! If youre going to attempt a house that appeals to everyone you will end up with a beige house, and from what I can tell, you are anything but beige! The piano is awesome. Going to be quite the centrepiece! I really, really like this. Seeing something so fresh and cheerful like this piano is one of the reasons I like reading your updates. I can’t wait to see your version of the wallpaper now. I’m very glad you went with something more “You”. i love it!! It is always better when decorating your own home to do it the way you want it done or when you walk into a room your heart will not feel it…. I am a piano purist and loved the walnut. I was not a fan of the gray but I loved the walnut… so having said that this is not my favorite.. However, my opinions doesn’t amount to a hill of beans and the only thing that matters is what makes you happy. I’m sure your vision will turn out wonderful and in the end I will probably be converted. I would never have been brave enough to do this.. but then what’s with a little stripper when you decide to change again someday.. probably a long way down the road.. It’s not like you chopped it up for firewood.. it’s all still there and can be made anyway your heart leads you. So I’m thrilled for you any way you want to go with it. “. . . it can be made anyway your heart leads you.” I love that phrase. Like Deb, I don’t like yellow. But I’ve never come across a yellow like this one, and it’s beautiful. Cannot wait to see it against your version of that wallpaper. You have completely inspired me. In the last two days, I have gathered everything I need to strip and paint a wonderful brown chair that I bought at a garage sale, with the intention of sprucing it up, in 1984! After seeing your elegant gray piano, I felt sort of depressed because it looked so “regular” that I started questioning my plans for the chair. But the yellow, and the contrast with what didn’t make you happy, has made me fiercely determined to paint that brown chair red . . . in spite of everyone else’s concern that it’s a bad idea. I don’t like yellow, no way, no how. EXCEPT THIS PIANO IS GORGEOUS. I think the wallpaper will be gorgeous with it too. I cannot wait to see the finished result. Ironically the yellow does really work with the style and flow of the kitchen and what you are envisioning for the dining room. Light, happy, fun. Glad you made the change. Ahhhh, yes. I remember you. Welcome back…we missed you! I like the yellow much better. But then, yellow is my favorite color; so I would. Didn’t much care for the gray, so I am glad you changed your mind. This piano is whimsical and fun – just like the pattern that will be behind it. Love it! it is perfect and so much more beautiful than the grey/wood-version – and bear in mind that this is said by somebody who loves grey 🙂 Now I can envision your wallpaper version with it and how that room might evolve. Cannot wait to follow you on that road! Have a happy weekend! I would love to see a photo-shop of how this is going to look against the birds and flower wall paper. Me too! I was thinking the exact same thing, probably because I’m impatient waiting for it all to be done! Nicely done. I particularly like the part you left with the decal and the contrast (is that painted black?). Now onto the walls! The black wall might work behind the piano, have you ever considered painting the branches and birds in white paint? So it is just like a black and white background. Something like a toile look. Maybe even do them in gold, to tie into the kitchen . Just some thoughts. I’m so glad you made this decision. I cannot wait to see your ‘wallpaper’!! I love this!! Before I retired, I worked for a heavy equipment company called Caterpillar. This color is the same (or extremely close) to their signature color for their machinery. When you showed the different shades of yellow you were considering, I kept thinking, “Wow. I bet Caterpillar yellow would be perfect.”…and it is! It’s a shade of yellow that is deep without being muddy and bright without being “glow in the dark”. It is definitely the perfect color for your piano, your house and you! I loved the grey and walnut…for my home! The yellow is perfect for you….that is all that matters. I adore birds and use them in as much design for home as possible. I can not wait to see the finished design. You have a gift and I am so happy that you are sharing it with all your followers. I knew I would like the yellow more than the gray, but holy cow. I liked the gray. I LOOOOOOOVE the yellow. It’s so you. It’s perfect. Hurray for you! As you said, “it is your house”. If YOU like it, it is good. You have to look at it. I just wish you were here to help me decide what to do with my buffet. Awesome piece but old finish and needs some sproosing up. I am soooo glad you painted it yellow! The gray just didn’t seem to be your style. The yellow is so you and I love it. I don’t comment often but I read your posts every time I get the email. I love this smiley face yellow piano! But so much more important than that, YOU love this smiley face yellow piano! I think the piano looks nice in yellow. 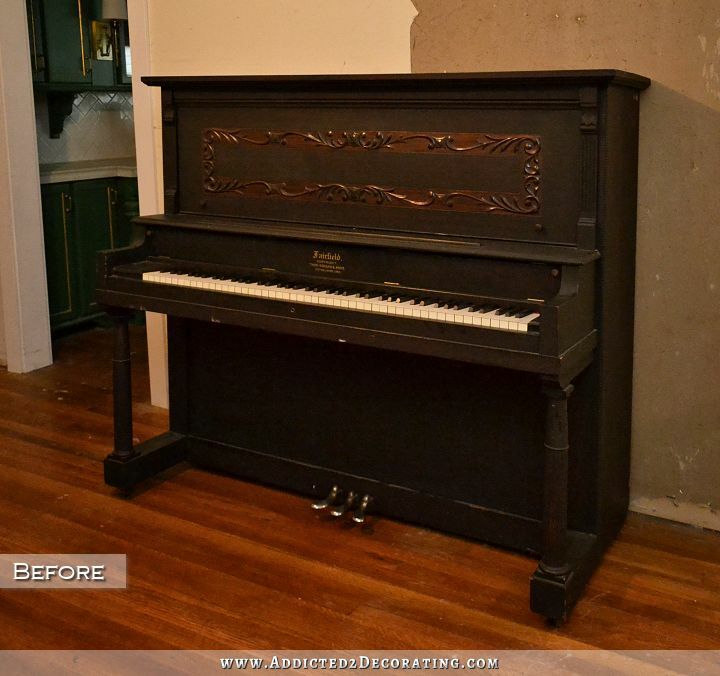 I liked the piano before too, with the grey and refinished color scheme. Well, it was free anyway, right and now you will be playing it an enjoying it so basically the piano has been preserved and protected. The yellow will also bring out the color of the birds, since it is really a goldfinch yellow. Now we get to the part I’ve been anxious to see – your creation of the wallpaper! OK – this makes me happy! Looking forward to seeing the birds. I am anxious to see this yellow with the birds! I think some distressing on the edges and the carvings would enhance the look tremendously! Hang in there! You do great work! I don’t like the yellow at all! Maybe I’ll like it better once the wall paper is behind it. I loved the gray/walnut although, I agree, it didn’t go with your decor. You should have sold it and gotten a different piano to paint. Around here, there are tons of free pianos on Craigslist. It probably wouldn’t have been too hard to find a different one. 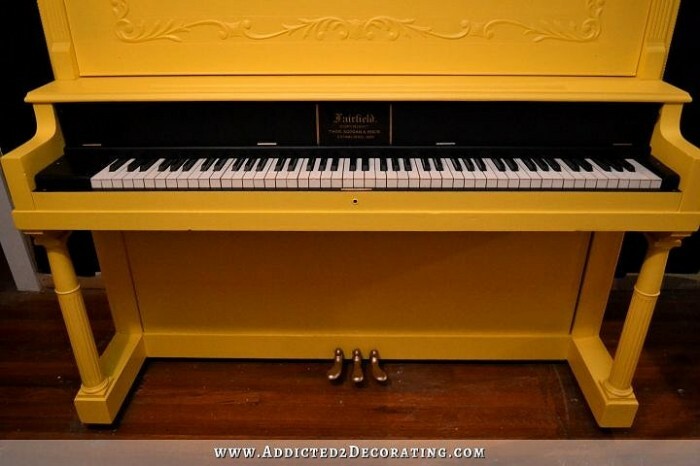 I think this piano is too elegant for paint, especially yellow paint. But, I may end up loving it once the rest of the room is complete. I totally agree with Ally. But then I’m not a fan of yellow. At all. I thought the grey and walnut was stunning and I was really disappointed to see it made over in this bright yellow. But it’s your house, Kristi. Do what makes you happy. Looking forward to seeing how it looks when the room is complete. All those details are just what makes paint pop on a piano though. A plain piano under paint would have been boring. Kristi, did you have to strip the gray paint then or you just painted right over it? I just gave the gray a quick sanding (very quick with 150-grit sandpaper by hand — no electric sander needed) and then painted right over it. Now the polyurethaned wood parts needed sanding (again, by hand), priming, and then painting. Exactly. So why would you think I could actually sell this piano? It’s has no monetary value, and I’ve already paid to have it moved. I doubt I could even make back the money I spent on having it moved. And I have to be honest. I HATE it when people say this to those of us who like painted furniture, as if those of us who like painted furniture should be relegated to only ever purchasing the used IKEA and particle board furniture of the world, while the real wood furniture should be left for the wood purists who wouldn’t dare cover it with paint. I like THIS piano. I wanted THIS piano. And I wanted it painted. It’s not like it’s just a piece of furniture. It’s a musical instrument, and I’m a piano player, and this is a very quality piano that I intend to play. I deserve a quality piano just as much as anyone else, and especially since I found it and I paid to have it moved (and saved it from the wood scrap heap). Sorry, but you clearly touched on a touchy topic for me. 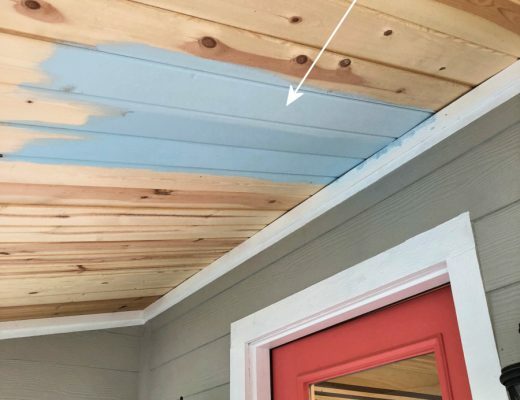 🙂 We painted wood lovers still like WOOD, and shouldn’t be left with the crap IKEA and particle board furniture just because we like paint. Well said! Keep doing what makes YOU happy. Again, thank you for inviting us into your home and inspiring us to take risks with our home decor. I think its absolutely perfect because its absolutely what you wanted. I’m so happy you decided to go with what you wanted. I am so glad you finally like it! Yowzers! That is yellow and sooooooooooo happy! It made me smile and I know it will be great next to you branches and birds. Truthfully I liked the gray piano but understand that it isn’t your style. Thank you for leaving the original manufacturer’s signature. PER-FECTA-MUNDO!!!! Now you’re talkin’! That yellow is just right, and I love how you left that little bit of black around the original manufacturer’s label. You NAILED it this time, Kristi! LOVE IT! I loooove that yellow and now need a project to use it on. I DO love the wood of the piano in the prior treatment (not combined with the gray, though) and would totally kill for a piece with that beautiful grain. But this. THIS IS SO YOU! I’m doing the whole room, but if you think about it, two of the walls really aren’t walls at all, and won’t have much on them. The “wall” that the pony walls and columns create will only have about three inches of wall exposed above the top moulding. That hardly counts as a wallpapered wall, so that leaves three walls. Then the wall opposite that is the rolling barn doors, and when they’re open (which they always are during the day), then again the only part exposed is the three or so inches above the top moulding. So that one doesn’t really count either, so we’re down to two walls. The piano wall has the door to the kitchen, and the other wall opposite that wall will have a widened doorway into the hallway, so it won’t have much wall space either. It sounds like a lot to put it on “all four walls”, but when you really think about how that room looks, it’s not much wall space at all. What a fun & happy shade of yellow! I am so glad you finally did what you wanted all along! Love it! As long as you are happy that is all that counts. You are the one who has to look at it everyday. As long as it makes your heart go pitter patter every time you look at it then all is right with the world. It looks so much better than 2 toned! I could hardly wait to see it with the wallpaper! Good going! The point is that everyone is decorating for their own enjoyment. If I had a walnut antique carved curio cabinet and was told that I should keep it in the original wood or else its value would go down and I would be “wrong” to paint it… then I would not be happy because I am keeping it for other people. 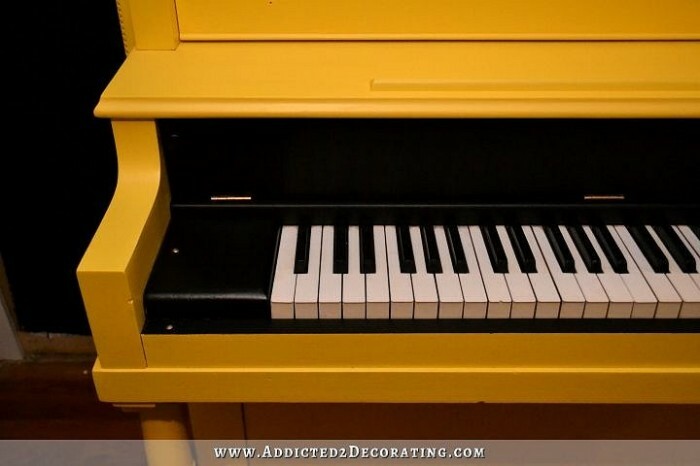 The piano is super cool, you can see the details through the yellow paint, and that’s what counts. It will be used and loved in the yellow color, and that is the precious value and purpose of the piece: to be loved by its owner. Wonderful! And now, please, follow through with your planned branches and birds on a white wall (as planned…not changing it just because you have black paint there!!). Then, if you want to change your project, per anyone’s advice, because you aren’t totally happy with how your vision turned out…fine! Just give your vision a chance first! On this, and all future projects. So happy you made it back to you! Much, much better 🙂 I did not like the grey piano at all. So very pretty! Personally I love the yellow. As a matter of fact I painted my front door the same color ( probably to the shagrin of my neighbors who seem to favor all shades of brown and beige) but I say, follow your own heart and your own vision to happiness. Well done Kristi! I am looking forward to the finished music room. Yes! Love how that turned out. Have to say, that gray might have been right for some people in other spaces, but I hoped you would choose a pure yellow from the start. I hope it’s not rude to say I told you so, because I did from that time you put up the various yellows in swatches, lol. Clear pure yellow is just right. That color just puts a smile on my face! Well done, Kristi, well done!!! Love it , love your style . bravo to the “decorator ” for channeling the “homeowners’s ” vision. I even love the black wall leading into the kitchen in the photo. Of course sometimes things Aren’t as good in person . I know you have your heart set on the original design but I would just have to draw some twigs and birds on that black in chalk before I covered it up (just for grins.) It would give you a practice board for laying out the design and scale . All I can say is :)! Love it! I like the black wall too, actually if it were me I would reverse the wallpaper and do white branches and colorful birds with black as the background. Oh, this is so much better than the grey! ♥♥♥ it! One cannot possibly walk through that music room without a smile on their face! You did it! In my opinion, anything within our homes that puts a smile on our face when our eyes light on it is a win-win. Keep those smiles coming, Kristi, for YOU and Matt! I LOVE the bright and beautiful colors you are adding to your little world. OMG I LOVE IT!!! (and I’m not really even a big fan of yellow. lol) But Behr aptly named that paint! How can you not grin when you see it! Kudos for you for going with your heart. I for one cannot wait to see the hand-painted wall ‘paper’ behind it! Woohoo!!!! Love it! And this from a musician who loved the original, but when I saw it I wanted to sit down and sing and play it! The greatest message takeaway from this for me is its never too late to change direction. I’m guilty of getting committed down a decorating path and once I’ve made a financial commitment I feel like I can’t turn around. Thanks for your WONDERFUL example that I CAN! Now THAT is a statement piece! Well done!! Good for you! It’s more your cheery style. I wonder though if painting the scroll black might make it stand out a bit more and complement the black near the keyboard. That wonderful design gets lost in the brightness of the yellow. AMAZING!!! SO much better than before…it is so beautiful and looks just like it “FITS YOU”!! Congratulations!!! The original walnut and grey reminded me of Victorian decor. Your yellow made me smile and happy. Yes!!! Now either of those colorful wallpapers will work! 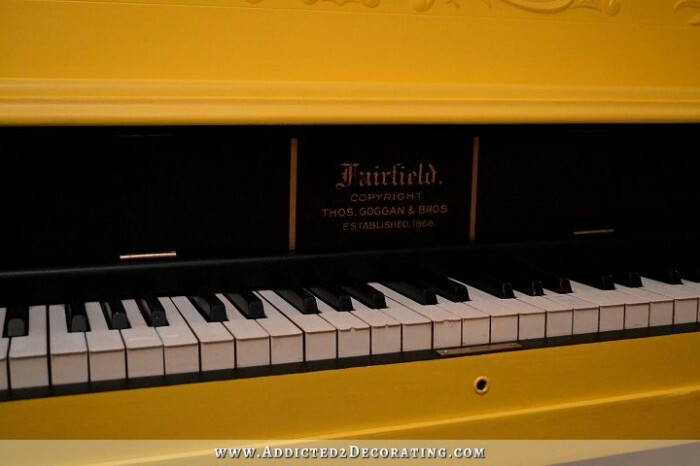 I have already commented on this topic a few days ago, but I just have to tell you again how much I LOVE this yellow piano!!! I just didn’t like the other piano with your décor….seemed too blah. You inspired me to paint my door in a bright yellow color called Joyful, and I am so glad I did! It just makes me happy and will make those long , winter days more tolerable. love the yellow and the little touch of the original. Did not like the gray so glad you changed it!!!!!! Perfect! I absolutely love it! I love it, I love it! I was so disappointed when I saw the gray, which on my screen it looked green piano, and so delighted when you decided to change your mind. It looks fabulous! It really is very pretty. I am not a painted yellow piano kind of person but I am a person who appreciates something that has been well done, and this has been very well done. 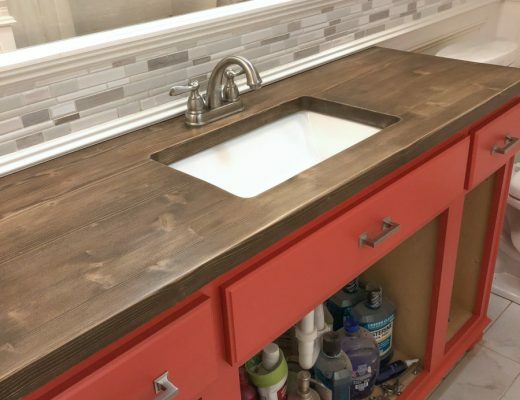 I am relatively new to your blog (I came in mid-process of the hall bath re-do; having been lead here by a search on what do to do with the empty space above my kitchen cabinets. Which was a fabulous article and after reading it, I am proud to say the space above my cabinets remains blissfully EMPTY! Thank your for that.) and have appreciated your process, thoughts, candor, humor and sage advice that can be found in your posts. Can’t wait to see what happens next! If an all yellow piano brings you joy, then its the correct choice. Yellow lifts my heart so many times. You go Kristi! Been following you and your courageous and perfectly imagined choices through all of your doubts and ultimate triumphs daily for over a year now. This looks awe-some, can’t wait to see the wall treatment! LOVE LOVE LOVE It! I liked the grey version but not for your home. You are such an inspiration. 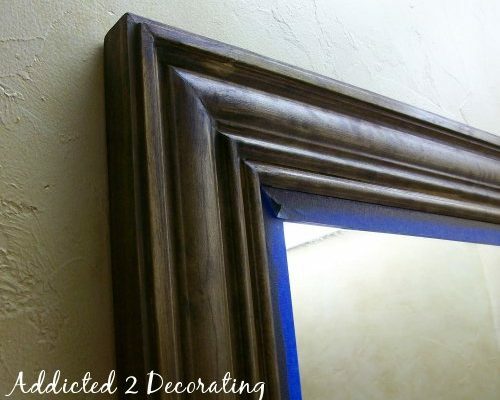 I am currently painting my dark wood bedroom set (all 8 pieces) a beautiful Napoleonic blue because of you and your blog. Thanks for putting it all out there and not being afraid to do what makes you happy. I am so happy that you went with your OWN vision! Its beautiful!! so they are incorporated into our home rather than sticking out like sore thumbs as they do. They look like grandmas hand-me -downs. I am gonna get my brushes out and do what I want to them now…no matter what the “family” says! Thanks for the inspiration and the courage!!! Like the yellow, but sure wished you had kept the same amount of the wood showing like you had with the gray. Just makes it look much richer, in my opinion. I tried that. The yellow with the wood looked terrible. All I can say is WOW! I can’t wait to see it standing in front of your “wallpaper”. Great choice! It’s perfect now! Way to go! 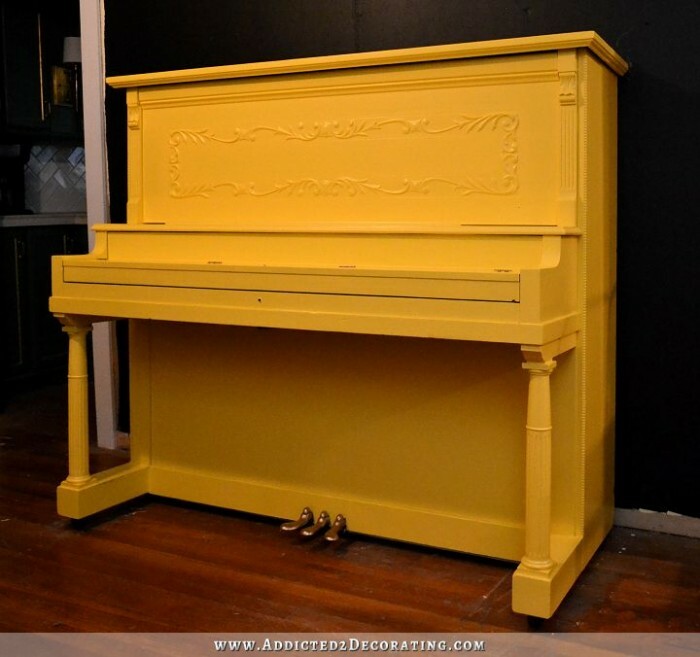 I love the yellow and can picture some of the same images from the wall mural/ freehand image on the middle section of the piano…maybe lighter than the ones on the wall. Anyway I did not like the grey and walnut but love the Yellow on the piano. Kristi, I am so happy for you! You followed YOUR vision and that is what you should do in YOUR home. This will bring a “smile” to your face every time you see it. That’s what our homes should do, make us smile, feel happy and loved. You have taught all of us a valuable lesson, follow your heart. I can’t wait to see your wall treatment! I LOVE IT!! I never reaized until today that the piano is sitting on the kitchen wall. I pictured it in my head as being on the opposite wall (which I believe is to the left ast you walk from the front to the back of the house). Stay true to yourself, Kristi! You rock! Actually, this gorgeous color shows off the lines and design better than anything else. It is just delightful! I like both versions. That said I am So glad you went with what makes you happy! Now that you have made such a statement with this beautiful yellow, what magic do you have in mind for the bench? Just as I knew you would re do your kitchen floors after the first striped reveal, I just knew you would redo this piano. It is beautiful and I can’t wait to see the room all put together! 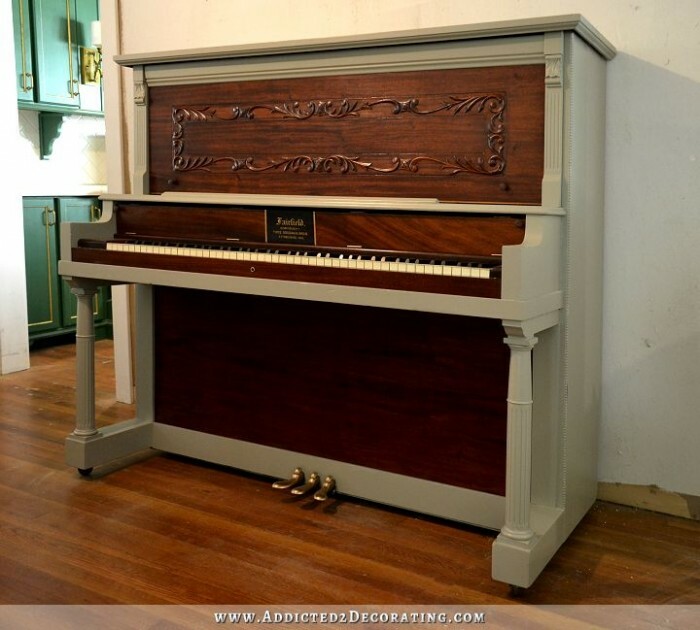 As pretty as the gray and wood piano was….it was just too dowdy and somber for your home. I was bummed when I saw it wasn’t yellow. I’m soooooo happy that you followed your heart and went with your first choice…Yellow!!! I can’t wait to see if in front of your birds and vines wall. 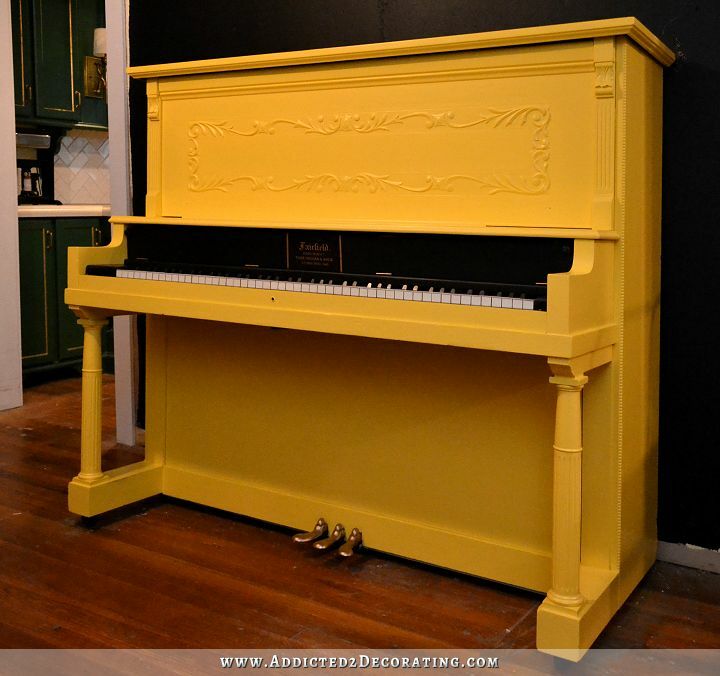 Oh-my-gosh Kristi, I LOVE the piano painted this yellow. It is SO YOU!!!!! Whilst I did like the grey and walnut, the yellow is definitely more you and now it will go with your branches and birds wallpaper design. Good for you for following your heart and dream of having a yellow piano. I think it will go very well this way with the wall treatment you’ve planned. But curious as to why you didn’t wait to paint the piano after the walls, just in case the Photoshop paste wasn’t a true representation of color and scale? I’m a retired graphic artist so I’m used to things printing out different from the monitor view and while I know you are mixing the paint, things change. It seems a little cart before the horse to me; however, I’ve read how your steps are made to keep you creative and I do get that. Were you that paralyzed by the grey? So proud of you that you refocused and went back to your original vision!! I just knew you would!! <3 I'm in love with your piano and can't wait to see it all come together!! LOL. Just left a comment on another page about you probably not wanting to paint the piano again, but I stand corrected. You’re not shying away from hard work. Congratulations on making the choice that is right for you. I know from my own experience that it’s hard to throw in the towel on a project when it seems like you should like it, but you don’t like it. Especially when there is not necessarily anything wrong with it, except that looking at it doesn’t make your heart sing.